Reagan, whose hair was as artificial as that of the current authoritarian occupant of the oval office, leveraged television fame into a career as a rightwing politician. As with Trump, the connections between garbage on TV and garbage in the White House is palpable. Like me, Scialabba tends to review books by authors for whom he has an affinity. In “The Reagan Counter-Revolution”, written for the Boston Phoenix in 1985, the parallels with Trump stick out like a sore thumb. The article was occasioned by one written that year by Walter Karp in Harpers titled “Liberty Under Siege: The Reagan Administration’s Taste for Autocracy”. Karp, to whom Low Dishonest Decades is dedicated, died in 1989. In putting this new collection together, Scialabba will bring young readers’ attention to some of the outstanding scholars and journalists of the left, some of whom like Walter Karp and Alexander Cockburn died far too young. Citing Karp, Scialabba points out that “On orders from the White House budget office, the Environmental Protection Agency consulted with the chemical industry on how to circumvent toxic-waste laws; when Congress tried to investigate, the president refused to release internal EPA documents.” Rings a bell, doesn’t it? In fact, rather than searching for predecessors for Trump in Nazi Germany or fascist Italy, nearly everything that Trump is now trying to do comes out of the Reagan playbook but, of course, raised to a higher power. What is Trumpism? Reaganism on steroids. For years the battle raged across my family’s kitchen table. My second-generation, inner-city, working-class parents complained angrily about welfare fraud, affirmative action, the coddling of criminals, too-welcoming immigration policies, and overly generous foreign aid, while honest, hardworking Americans like themselves, “born in this country,” couldn’t get a break. My older brother sometimes joined them but mostly sat back and enjoyed my exasperation as I, the college boy, insisted shrilly but unpersuasively that all their anecdotes were just exceptions, that liberal policies were essentially fair and rational, and that instead of blaming the unfortunate they should make common cause with other little people against the rich, who, for some reason, were completely off their radar screen. Fortunately, the habits of a lifetime kept them from ever voting Republican. But what Thomas Frank calls “the Great Backlash” had won their hearts. As is the case today, liberals and radicals alike wrestled with the question of why white working-class voters voted for someone like Reagan who was so inimical to their material interests. For Frank and so many others, the answer was that the Democrats had forsaken their New Deal roots and emphasized cultural politics that alienated “the deplorables”. When Scialabba wrote this review, the rightwing was exploiting outrage over “Piss Christ”, a 1987 photograph by Andres Serrano of a crucifix submerged in his urine. Today, the outrage is over the transgendered taking a piss in the “wrong” bathroom. Bodily fluids once again trumping reason and humanity. I would only add that Twitter is far worse. With a ceiling of 140 characters rather than 800 words, I wonder why any thoughtful person would bother. Then, again, there is Donald Trump. I admit to being puzzled by Scialabba’s decision to read and review Krauthammer’s ponderous tome. Written for The Nation, was it a project they imposed on him? As someone who writes movie reviews for fun rather than money, I am glad that I don’t have to write about Adam Sandler movies to pay my rent. On August 31st, he retired from the day job. A week and a half later, the magazine The Baffler threw him a campy retirement party, “Three Cheers for George Scialabba,” at the Brattle Theatre, in Cambridge. There were toasts by Noam Chomsky, Barbara Ehrenreich, Thomas Frank, Rick Perlstein, and Nikil Saval. The Cambridge City Council had just passed Resolution 658, making that day, September 10, 2015, George Scialabba Day. The whole idea was a cackling jab at the pomp and officiousness Scialabba himself so utterly lacks. The City Council’s resolution noted that Scialabba had “diligently fulfilled the room scheduling needs of overpaid professors for 35 years” and asked Cambridge residents “who still practice the habit of reading to place their collective tongues in their collective cheeks” and celebrate his marvelous deeds. “I really don’t see any justification for it,” he’d told me the day before. To his admirers, Scialabba is something of a literary monk, shuffling virtuously in the background, spurning public attention. His writing completes the portrait: his measured essays generally concern better-known thinkers, more roaring, titanic writers whose own work stomps imperiously down the page. “As far as I know, I’ve never had a genuinely original idea,” he told me. He promised that this wasn’t a boast. Trust me. George Scialabba, who I am glad to know as a friend, is filled with original ideas. 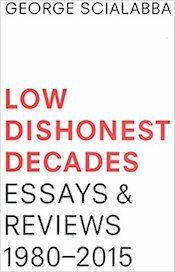 Buy a copy of “Low Dishonest Decades: Essays and Reviews 1980-2015” and you will find them leaping off each page.